Unfortunately in my country I can only buy very primitive vitamins. I'll try to buy in America. I want to ask: If you give good vitamins (which ones?) Then how many hours should the lamp Zoo Med Reptisun 5.0 UVB shine? /\ Please re-check post 8. I added a picture of the measuring spoons I use to catch Blaptika dubia. I have never bred Lygodactylus williamsi. UVB lighting can be tricky. Fran Baines (a lighting "guru" and vet from the UK) recommends a backup dose of vitamin D3 @ 1 feeding per month even when using UVB. Maybe you can get Repashy's Calcium Plus from your friends in America. acpart (Aliza) uses that for her geckos. @acpart ~ Please share how you use Repashy's Calcium Plus multivitamins along with UVB lighting for your Lygodactylus williamsi. I use Zoo Med's Reptisun UVB lighting for 3 Phelsuma. I leave it on during the day. A couple years ago I relocated one 18 inch Slimline fixtures to be perpendicular to the length of their enclosure instead of parallel to it. Those 3 geckos are totally dependent upon their UVB lighting for vitamin D synthesis. I have kept those geckos that way for about 15 years. For them I use Zoo Med's Reptivite without D3 @ 1 feeding per week and no supplements @ the other feeding per week. Last edited by Elizabeth Freer; 01-31-2019 at 03:19 PM. Not everyone does things the same. Different geckos and different enclosures need different approaches. Maybe you can get Repashy's Calcium Plus (all-in-one multivitamins) from your friends in America. acpart (Aliza) uses that for her Lygodactylus williamsi. Last edited by Elizabeth Freer; 02-07-2019 at 06:29 PM. Spoons saw, thank you. I do not have such, but the idea is clear. I tagged Aliza. She usually stops by Geckos Unlimited in the evenings. Right now it's 1:30 PM Oregon time. These guys are small, but very active. I wouldn’t go any smaller than a 18x18x24 and that is even small in my opinion. I figured a visual would be helpful. 1. Can you get an Exo Terra 18 x 18 x 24 enclosure instead? If yes, then your bulbs may need to be stronger. 2. How many Lygodactylus williamsi will you have? Last edited by Elizabeth Freer; 02-01-2019 at 12:15 AM. 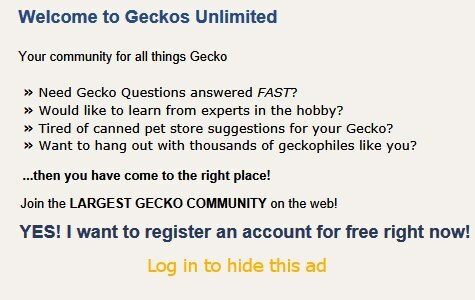 I have done fine with these geckos in 12x12x18 but I'm sure they'll appreciate 18x18x24. I use the Repashy calcium plus to dust the crickets at every feeding (3 times a week) because, as I mentioned before, it's hard to know whether the gecko will get to all the crickets before they groom the supplement off. There are day gecko keepers who don't use UVB for their geckos at all and depend on the calcium and D3 in the fruit food and on the crickets to provide what the geckos need. I kept a gold dust day gecko that way for 12 years and she did well. In my opinion, if you get whatever UVB bulb you can find, use the Pangea food and dust your crickets each time with the Repashy Calcium plus, it's likely that you will have a good outcome. Already bought a Exo Terra 12 ”x 12” x 18 ”terrarium. I expect a couple of Lygodactylus williamsi. Monday: insects + Repashy Calcium plus. Wednesday: REPASHY Crested Gecko MRP (or Pangea Fruit Mix ™ With Insects Complete Gecko Diet) What is best to use? Friday: insects + Repashy Calcium plus. I beg you to look at the menu, which I made and comment. If there are comments, please write the full replacement name. This will help me to make the right order. Thank you, best regards, Max. Last edited by Gardener; 02-03-2019 at 04:01 PM.